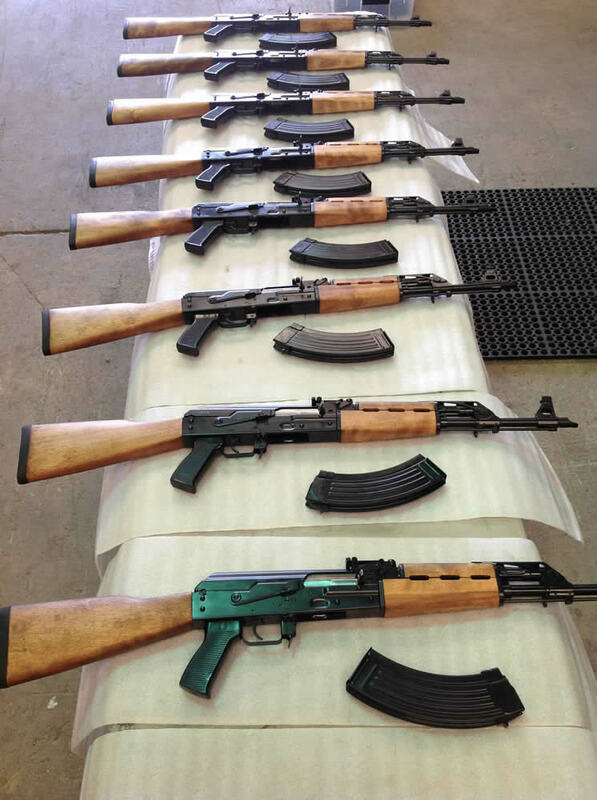 After importing thousands of AK-47 rifles from many countries, Saddam Hussein ordered the Iraqi Ministry of Defense in the late 1970s to pursue a domestically produced copy of the AKM rifle to replace worn out rifles for Iraqi troops in the continuing war with Iran. 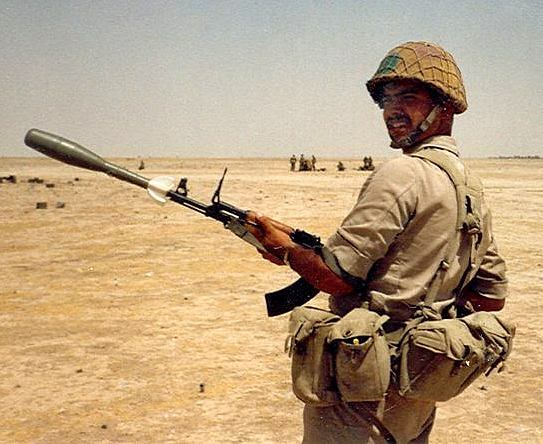 Iraq is known to have fielded the first Tabuks by at least 1980, making them a veteran of the Iran - Iraq War, the Gulf War, and Operation Iraqi Freedom. 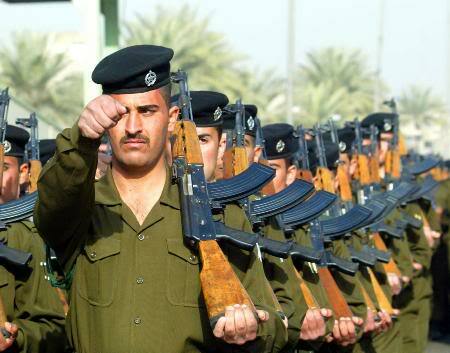 The rifles are currently used by all segments of the new Iraqi Defense Forces and continue to be among the most serviceable and robust weapons among Saddam-era arsenals. Iraq is now replacing it with the imported Colt M-16 Rifle. Two Rivers Arms semi-auto Tabuk rifles replicate the look and feel of Iraqi domestic rifles and come with a replica Arabic rifle manual identical to the original issued to Saddam's troops. These rifles have matching numbered parts with authentic looking wood. The wood is made from European Birch and is sanded, stained, matched and finished to present an outstanding and authentic appearance with the broad grains on Iraqi wood. By carefully selecting compliant parts, the external appearance remains consistent with the actual military rifles. No cheap or quirky external parts that force you to alter your rifle later to make it look correct. For an optional fee, an arms room stock number in Arabic can be painted on your choice colors such as red, white, blue, and black circles with various colored numbers. A Bulgarian Type II Bayonet, near identical to Iraqi types, can also be added for an extra fee (Other items shown are for display only). Tabuk AK-style rifles are marked on both the left and right side of the rear sight block that houses the tangent leaf sight. The left side is marked with the Tabuk emblem and Arabic nomenclature. The emblem is a side view of the icon 'Lion of Babylon' set against a pyramid. This famous ancient statue depicts a lion standing over the human figure. The lion has a saddle and is supposed to have been ridden by Ishtar, the ancient goddess of fertility, love and war. The right side of the sight block is marked in English. It has the word 'Tabuk' on the top row followed by 'Cal. 7.62 x 39 mm' on the bottom row of text. This is the same text that is found in Arabic on either side of the Lion circle emblem on the left side of the block. Two Rivers Arms uses advanced engraving techniques to replicate the Iraqi sight block markings in every detail. 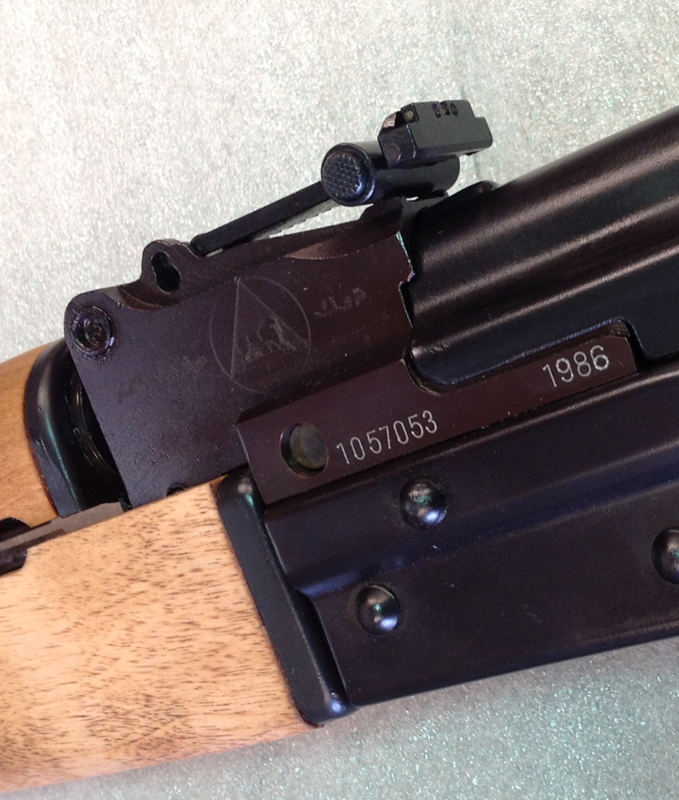 Actual Iraqi rifles were used to mimic the marking and design in every dimension. While some homebuilders have copied the logo, no markings to date compare to the quality of Two Rivers Tabuk TM style rifles. Each Two Rivers Tabuk TM rifle has Arabic selector marks on three notches to replicate originals (rifles will only fire semi-auto), as well as matching bolt, bolt carrier and trunnion. Two Rivers Arms also replicates the full military appearance of the Iraqi Tabuk style rifle. The grips are made to exact specification of Iraqi originals. The finish is hot blue as per orignals - no flaking from 'durable' coatings that never are durable. Rilfes also have chrome-lined bores and may contain up to eight 922r compliant US made parts. Original Yugo non-chrome barrels in excellent condition can be special ordered on your rifle by customer request. 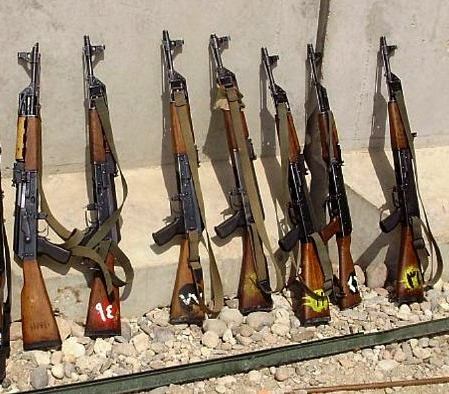 Every rifle comes with an exact reproduction of the Iraqi rifle manual issued to Saddam's soldiers. The manuals are in Arabic and are made from a rare original. These rifles are the closest thing to the rifles that the soldiers were not permitted to bring home as war trophies or souveniers. 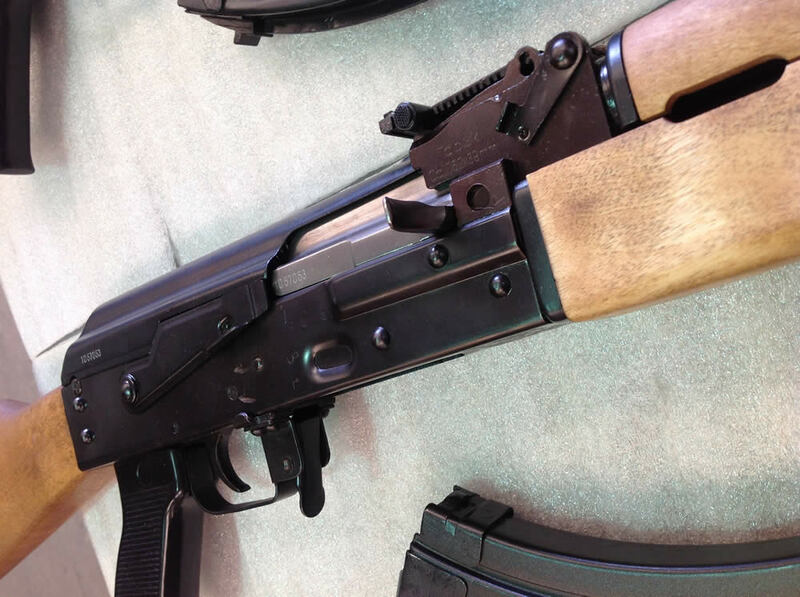 Now you can own that special heirloom or add an Iraqi AK to your rifle collection.